Get the Advantage: There are plenty of keen anglers out there that are trying their hand at soft plastic fishing, but are struggling to hook any decent fish or those anglers that would like to fine tune their soft plastic skills. So if you are happy to get your feet a bit wet, enlist the expertise of the man who know fishing best: Brian from Angler's Advantage Charters. He has over 3 decades of angling experience across 4 continents! Brian's specialty is soft plastics, and his passion is sharing his skills and teaching others. His custom built Polycraft 4.8m Brumby is excellent for reaching a number of local hotspots during a trip. Brian has a Navman colour depth sounder to locate contours and bottom structure where the fish love to congregate, electric bow mounted motor to allow the boats to stay on top of the good fishing grounds and a quiet yet powerful 80hp Yamaha 4 stroke outboard to get you from the boat ramp to the fishing grounds quickly without spooking the fish. Coupling Brian's experience with a keen angler's eagerness should be a recipe for success in targeting flathead, trevally, mangrove jack, estuary cod and even jew in the rivers. Brian always starts a trip by looking at the features needed in a rod and reel suitable for river use, then goes through the skills required for each species targeted plus how to best use soft plastics and hard bodied lures in the hunt. If you want more info on the type of service Brian has to offer, give him a call on 0424 788 379 or you can check out his website: www.anglersadvantage.com.au. And a subtle hint for the weather gods - may their New Year's resolution be something like - perhaps 2011 could be the year of less extreme weather patterns...hasn't Queensland had enough drought, flooding, cyclonic winds this past year? Noosa: Whiting throughout the lower river. A few trevally in woods bay at night on the high tide. Golden trevally, flathead and bream from the lower reaches. Mud crabs in Weyba Creek and in Lake Cooroibah. 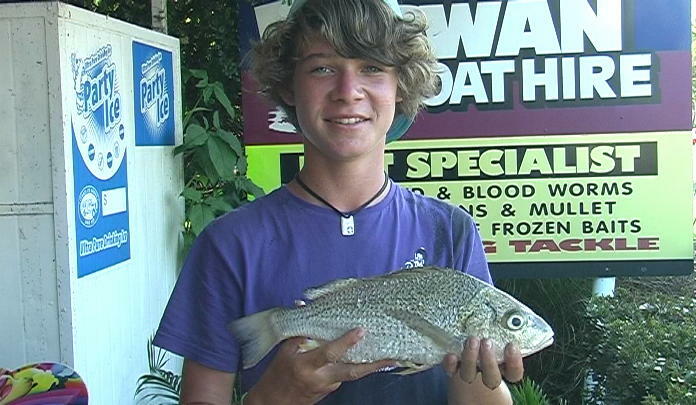 Maroochydore: A few good bream to 42cm along Mudjimba beach yesterday morning. Whiting, bream, tarwhine, flathead and trevally from the mouth on the making tide. Jewfish in the middle reaches. Flathead, a few whiting around 30cm, a star gazer and bream from Chambers Island. Mud crabs from, Chambers Island, Bli Bli and the canals. Kawana: Yellow fin bream, grunter bream and the occasional whiting along La Balsa Wall. 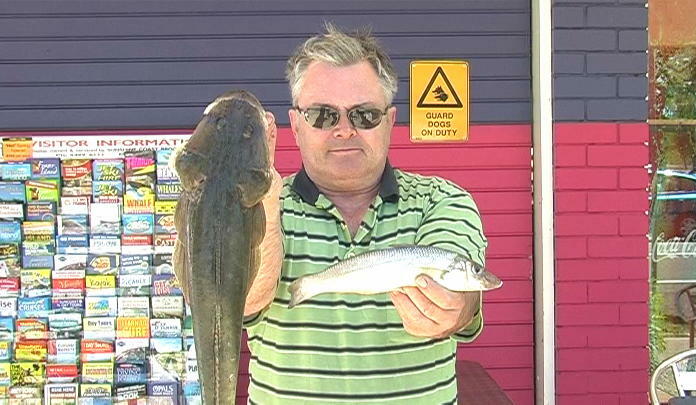 Whiting, dart and a few flathead between Kawana and Wurtulla beaches. A few grunter bream in the upper reaches. Mud crabs in the canals and in the upper reaches. Caloundra: Bream and whiting from Moffat and Shelley beaches. Mangrove jacks in the creeks. Whiting throughout the lower reaches. Bream, whiting and flathead from the mouth of Currimundi lake. Mud crabs throughout the passage. 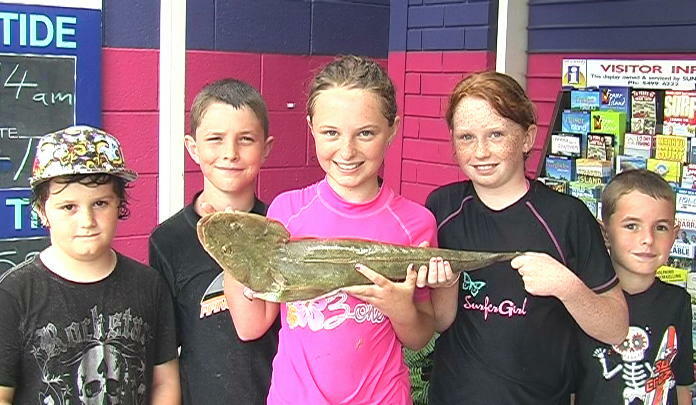 Tiana, Courtney, Drew, Jarred and James were enjoying their school holidays fishing with the family at Maroohy River mouth when they caught this 66cm dusky flathead. Tim Turner spend a day out on the water with Anglers advantage and landed this quality Maroochy river bream on a Nuclear chicken Gulp minnow. Sarah braved the wet weather on an Anglers Advantage charter for this golden trevally on the dirty water line in the Maroochy River mouth. FISHING IN THE RAIN - THE GUIDE! If you tell me you've asked Santa for a fine, sunny day or two for Christmas, then you are not alone! I bet that is at the top of the list for many little kids and big kids, Queensland wide. This incessant rain is beginning to annoy even the most tolerant of people, while families with small children may also be finding it hard to explain (over and over again) why it's still raining! Luckily the rain has given me the time to think hard about how we can still fish during this type of weather, especially when kids are involved. Seek out a Bridge: Let's face it, there's only so much time you can stand wearing a raincoat, unless you are skillful enough to master easy casting in one. The best solution is to find a spot affected the least by rain. Bridges are the best structure do to their solid nature and the fact that their pylons are perfect hiding spots for fish such as bream, trevally, mangrove jack and cod. At Noosa, Munna Bridge and around the Sheraton are worth trying. In the Maroochy River, as mentioned before; The Motorway Bridge, Petrie Creek and even the small bridge over Cornmeal Creek near the M1 building are ideal. Cotton Tree has some pretty big leafy trees very close to the water that will provide some cover as well. In the Mooloolah-Kawana area; try the Motorway bridges by Bridge Seafood, Parearra Channel and parts of La Balsa Park have substantial tree coverage. Caloundra has the Pelican Waters inlet where several bridges are and protected areas. If you still are stuck for something to do fishing-related by out of the weather, then head to Underwater World with the masses where you can look longingly into the pelagic tank or play mind games with a big Grey Nurse until the rain eases! I would also like to wish everyone happy holidays, play it safe on the water as all kinds of hidden debris will be floating around. And Santa, please bring back some long, hot, dry days so my tacklebox can dry out in time for some serious fishing action! Noosa: Spanish Mackerel 10-15kg and spotty mackerel between the river mouth and Sunshine reef. Cobia and dolphin fish from North Reef. Flathead and whiting in the frying pan. Mud crabs in Weyba Creek and in Lake Cooroibah. Maroochydore: Spotty mackerel between Old woman island and Currimundi. Mudjimba beach has been producing dart, whiting and flathead. Bream, tarwhine and whiting in the lower river on the making tide. Mud crabs throughout the river, with a few caught near Cotton tree. 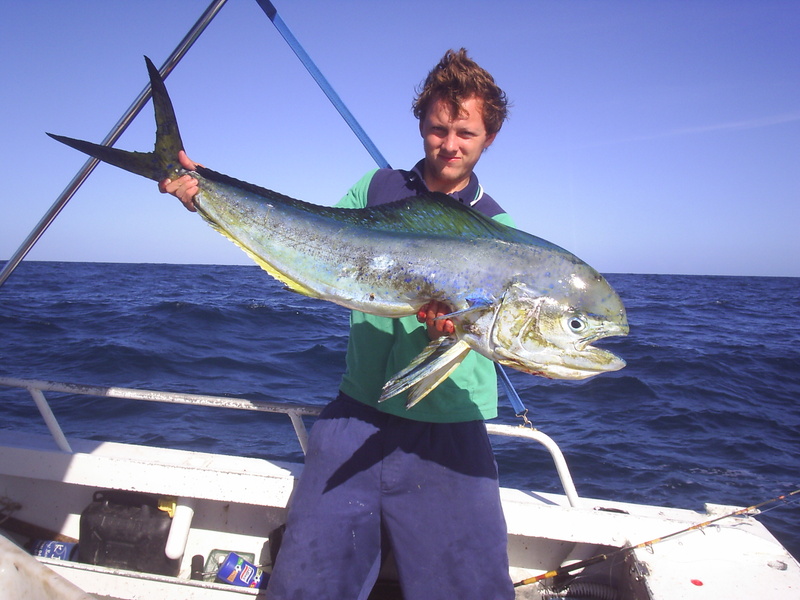 Kawana: Spanish Mackerel and yellow fin tuna on trolled baits and lures from Murphy's reef.. Bream along La Balsa Wall. Whiting off the beaches. Caloundra: Spotty and School mackerel from Currimundi Reef. Trevally from the boardwalk on high tide. Flathead just inside the bar. A few whiting from the mouth of Bells. Grunter bream from Bullcock Beach. Mud crabs throughout the passage. 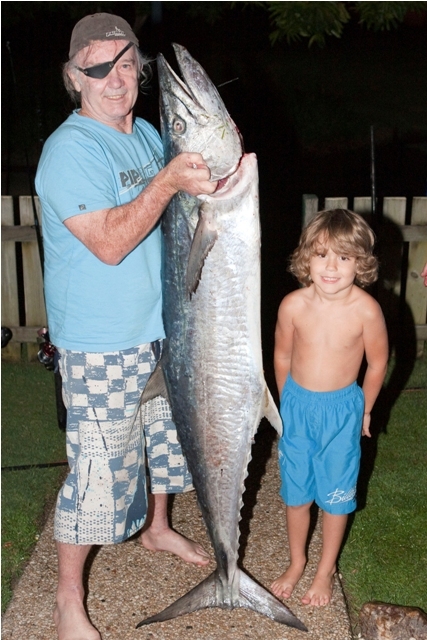 Patcho McGill and his grandson Jake McGill were trolling garfish around Point Cartwright when this 35kg Spanish mackerel smashed the bait. 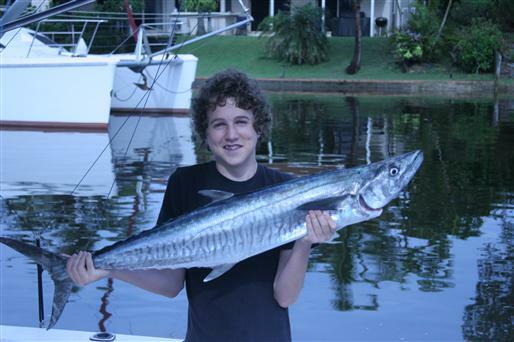 Zane Tuckwell was fishing out from Mooloolaba on Monday morning when he hooked this 7kg spanish mackerel. Looks like we are definitely getting our fill of rain - hope the dams in Queensland are full to the brim and the chance of a drought is well and truly off the cards this summer. As for the Sunshine Coast, may it go on record that we have really only experienced a couple of actual ‘Summer' days so far and we are already halfway through December. Is this a sign of our Summer ahead? Meteorologists around the country are speculating over the wet Christmas/dry Christmas alternatives. One thing is for sure, we have had more than enough rain in the past week to make the local rivers and estuaries rise to a level which has had locals wondering if a flood is on the way. Bucket-loads of rain coupled with big tides associated with the full moon on Tuesday December 21 have fishing and boating groups on their toes and looking out for dangers that may follow. The key ingredients required to create a flood, be it flash or non-flash include: Heavy rainfall caused by severe thunderstorms -isolated storms typically cause flash flooding in relatively small catchments or organised systems may extend to affect more than one catchment. Plus if we add a dash of poor drainage into the mix, caused usually from built up sand or mud, then your flood will fully develop into an erosion causing danger almost immediately. The chance of increased swell or even tidal wave would definitely wreak havoc on our coastline, when combined with flooding. 1. Minor flooding: Causes inconvenience such as closing of minor roads and the submergence of low level bridge. 2. Moderate flooding: Causes the inundation of low lying areas requiring the removal of stock and/or the evacuation of some houses. Main traffic bridges may be closed by floodwaters. 3. Major flooding: This causes inundation of large areas, isolating towns and cities. Major disruptions occur to road and rail links. Evacuation of many houses and business premises may be required. In rural areas widespread flooding of farmland is likely. Wading through flood waters is dangerous for several reasons. First, flood waters can be moving at a rapid pace. Before you know it, you can be swept away and drown. Next, flood water can contain hundreds of different chemicals that are harmful for the body. In addition, bacteria and other microorganisms can cause disease and infection. Driving in flood waters is dangerous and risky. Cars can be swept away in just a few centimetres of water. Drivers can become stranded with their car being rolled or engulfed in water. Every river has its own unique flood stage. Every single time a warning is posted for floods, be prepared. Many people assume they are not in a location to be affected by a flood, but this is not true. Once a river reaches flood stage, the results can be disastrous. Always remember that electrical lines and water do not mix. Standing in water and attempting to remove electrical wires is extremely dangerous. Also remember that even if you do not have power in some locations in your house, not all the lines could be dead. The runoff of water from heavy rainfall not only causes erosion and takes away valuable soil from farming land, residential homes etc, but with the soil can come chemicals, fertilisers and other toxins the human body is not able to cope with. Eyes, ears and respiratory systems can easily be affected after a swim in dirty river water as it is impossible to know could also be in the water. As always avoid diving or jumping into any water you are unsure of the depth or hidden obstacles underneath. Floods can damage roads and bridges. Unseen structural damage can mean it is not safe to drive on previously flooded roadways. Be sure that the area has been inspected by officials and approved for travel. Swollen rivers can carry dangerous debris in the form of dead logs, tree branches, weed masses, structures like fencing and wire which may have been caught up in the fast flowing water. Often though, the debris is sitting just below the surface or wedged right in the path of your oncoming boat! Normally you would be able to see the dangerous underlying log but the murky brown water we have after such a large amount of rain is impairing your vision - so take due care when boating, avoid areas close to shore where debris is most likely to get caught. Common sense is the best rule to apply in situations like flooding, thunderstorms and natural disasters. Though the local rivers and estuaries are not flooding, the increased rainfall and big tides might lead to some flooding over roads this weekend. Fingers crossed that the rain subsides now some nice big juicy mangrove jacks and mudcrabs come out of hiding after a big flush out of the estuaries. Noosa: Coral trout, sweetlip, Spanish and spotty mackerel up to 6kg from Sunshine reef. Good numbers of mangrove jacks, trevally and large flathead in Woods Bay. Large numbers of whiting in the Frying Pan on poppers during the outgoing tide. A few mud crabs in the upper reaches. Maroochydore: Snapper, sweetlip and schoolie mackerel around the blinker. Large whiting and tarwhine from the mouth on the incoming tide. Flathead to 72cm from Chambers Island. Grunter bream and flathead on the Bli Bli flats. Plenty of mud crabs from Bli Bli bridge and further upstream. Kawana: Snapper, red throat, parrot and Dolphin fish from the Barwon Banks. Large numbers of bream throughout the river. Grunter bream from McKenzie’s bridge on high tide. Quality whiting, tarwhine and flathead along Kawana beach. Mangrove Jack and Mud crabs in the canals. Caloundra: Sailfish and dolphin fish have been caught out past the 12 mile. Mangrove jacks and trevally in the Pelican waters canals. Good catches of whiting and flathead from Currimundi lakes. Whiting and a few flathead close to the bar on the incoming tide. 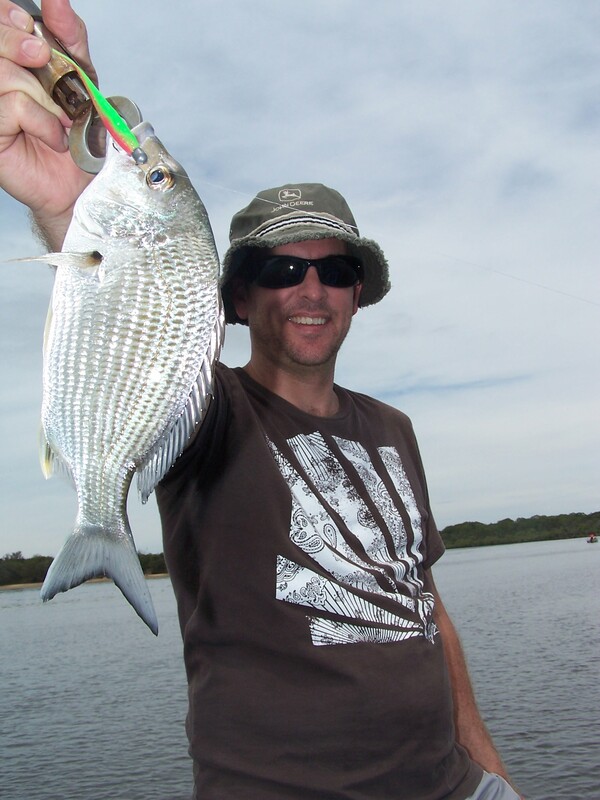 Matt caught and released this healthy grunter bream while fishing the Maroochy with Anglers Advantage fishing tours. 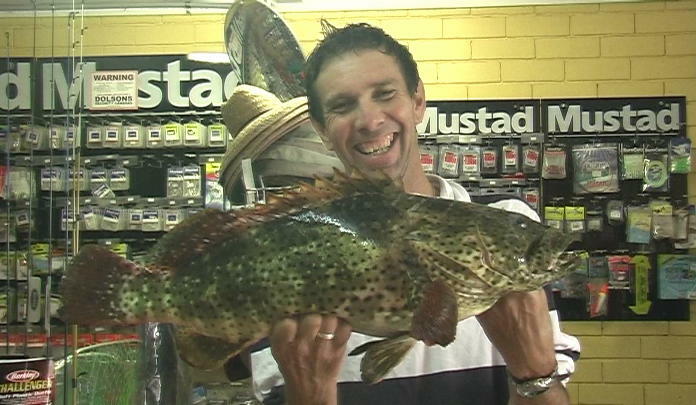 Jason Armstrong headed out to Mudjimba Island for a fish and was pleased with this grass sweetlip and 70cm flathead. School is over for yet another year and that means packing away the lunch box, pencil case and library bag to reinstate the camping gear, beach rods and wide-brim straw hat. At 3pm today I would expect to see quite a few 4WD's packed to the roof with camping and fishing paraphernalia rolling into the quick pickup zone in the school car park. This is one Queensland tradition that occurs every Christmas holidays and has done so since before I was a school-goer. Always drop tyre pressure before hitting the sand - it's better for fuel economy, easier to enter the soft sand, lessens the chance of getting bogged and is generally better for the wear and tear of your car. Enter and leave the beaches at designated beach access points only to minimise dune destruction and getting bogged. Use formed tracks only and never make new tracks - look for ruts in the sand, let the car follow them rather than going against them. The car's steering will thank you for this later...as will your arm muscles. If you need to exit a track, turn the wheel quickly and sharply at a lower speed and your tyres should jump up and out of the track. When taking off from a stationary position, reverse a little first as sand builds up in-front of the tyres as you stop. By reversing you not only compact the sand behind you - which aids your take off, but also you will not have to take off over a little mound of loose sand. Prohibited areas are indicated with signs - Noosa North shore for instance and some roads are clearly marked as closed to 4WDs, this is for protection of natural habitats or your own safety. Always carry a pressure gauge together with a pump to re-inflate your tyres before travelling on normal roads. Being prepared will help you get your vehicle out if you get bogged in soft sand. Carry a shovel, tow rope or traction aids - and know how to use them. Avoid the salt water as much as you can. Too many anglers have driven in the small waves find that sometime down the track, they've contracted rust! As an angler, be wary of cars on the beach as this is the same as if you were fishing on the edge of the highway. Drivers will drive too fast, not give way, tailgate and overtake in poorly chosen areas - be sure to educate your children on beach safety as well. Driving on the harder sand between the waterline and the high tide mark will offer the firmest surface. Consider reducing your tyre pressure when driving on soft sand but keep within the manufacturer's specifications. Vehicles should be kept off the sand dunes except at designated crossing points for access to and from the beach. It's best to travel at low tide, or within two hours either side, however fishing is often best either side of high tide so leave this time free for fishing only! Set up camp and get out your deck chair. Find a good elevated position where you can spend some time observing the water. Visually identifying structure is the way to go on a surf beach. Knowing how to identify banks, gutters, drains and rips becomes essential if you hope to regularly catch fish from the beach. Additional observations of swooping birds and for the more experienced, identifying bait fish and the species of fish we wish to target will give you the edge over 99% of other anglers. With constantly shifting sands due to wind and wave action, the sand banks, gutters and holes are ever changing. Whiting, dart and bream feed in the surf gutter year round. At the moment there are some quality tailor and cobia being taking along the Teewah stretch. Big jew can be caught in the deeper gutters as they cruise through feeding at dawn, dusk and over night. Sand flathead and tarwhine also feed throughout a variety of gutters. Things to look for in a good gutter can be plenty of white water which fish like dart and tailor like to feed in. Deep entry and exit points also allow fish to migrate through. Bait fish within the gutter, pipi and sand worm in the shallows on low tide also help. Because when bait or food is available for the fish, they are more likely to stay and feed longer. Like all forms of fishing, dawn and dusk are excellent times to try your luck. Noosa: Schoolie, spotty and Spanish mackerel up to 6kg from Sunshine reef. Whiting and flathead just north of Teewah. Large numbers of whiting in the Frying Pan on poppers during the outgoing tide. Bream and flathead from Weyba creek. A few mud crabs in the upper reaches. Maroochydore: Parrot, snapper and schoolie mackerel around the blinker. Small snapper and a 4.5kg cod from Currimundi Reef. Mudjimba beach has been producing a few bream, whiting and flathead. Whiting to 40cm and tarwhine to 30cm from the mouth. Flathead to 72cm from Chambers Island. Grunter bream on the Bli Bli flats. Plenty of mud crabs from Bli Bli bridge and further upstream. Kawana: Snapper, red throat, parrot and Dolphin fish from the Barwon Banks. Good numbers of school mackerel from the Inner Gneerings and spotty mackerel from Currimundi. Grunter bream from McKenzie’s bridge on high tide. 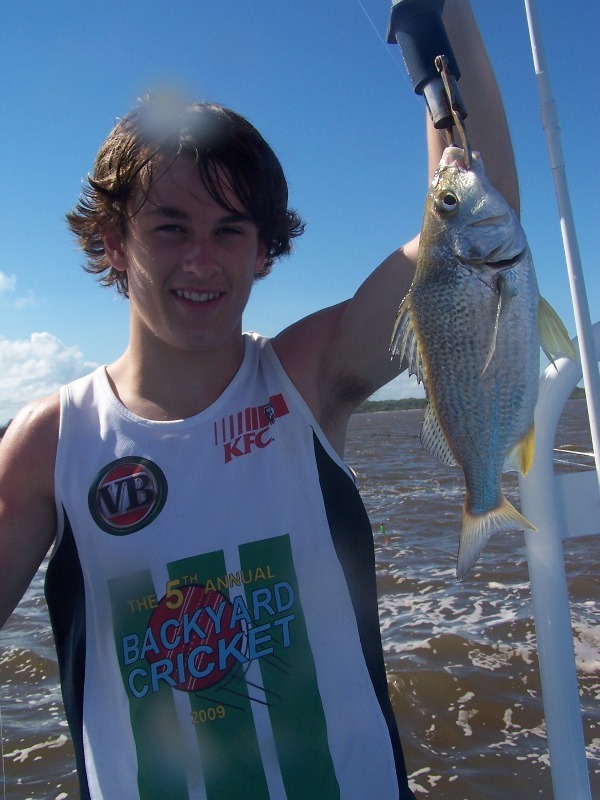 Quality whiting and flathead along Kawana beach and also a few whiting from Mooloolaba beach. Mangrove Jack and Mud crabs in the canals. 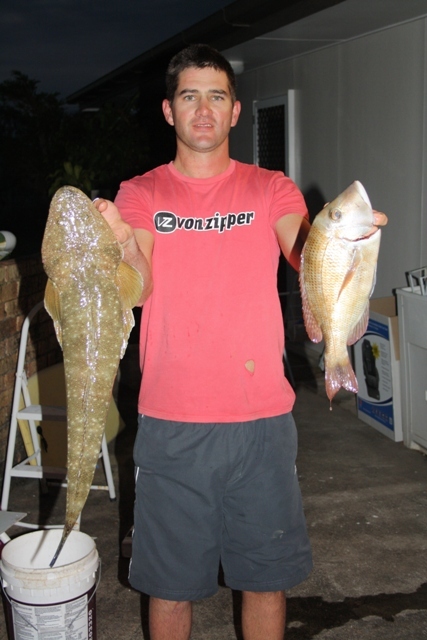 Caloundra: Mangrove jack and a few bream from the Blue hole overnight. Bream and a good number of trevally from the mouth of the Pelican waters canals. Whiting and a few flathead close to the bar on the incoming tide. Mud crabs throughout the upper reaches. Andy Gunn braved the wet weather and venture to Currimundi Reef, where he was rewarded with a solid 4.5kg rock cod on light spin tackle. The grunter bream have been very active over the last week and Cory Duckett fished in Petrie creek and caught this 35cm grunter. Christmas is now exactly one month away and don’t start shaking your head in disbelief because a certain white-bearded man has been doing the rounds in a certain shopping centre for weeks now. I hope you are reading this early enough to calculate the weeks, albeit even be it only days until the onslaught of junior boaties, sandcastle builders, swimmers in your favourite gutters and of course hundreds of 6ft kiddie rods cast off every jetty, rock wall and beach between here and the shopping centre (where their very smart-thinking mothers buying Christmas presents in air-conditioning!). As well, the influx of interstate and international tourists is evident from the record crowds already hitting the local beaches and rivers. With this in mind, remember to play it safe on all waterways during the Christmas and school holiday period. · Abide by 6 knot zones as they are in place for safety reasons. I see a lot of boats speeding through the Cod Hole area even though it is a 6 knot zone. The slow zone 200m either side of the Motorway Bridge was put in place due to the quantity of boating traffic to pass through this area. · Stay 30m+ away from any swimmer or non-motorised craft. The number of injuries caused by getting a too close can easily be avoided by keeping a safe distance. · When using the boat ramps allow plenty of extra time in your schedule to launch as most major ramps will probably have a fair bit of congestion. Make sure your boat is completely ready for launching when you back down to the ramp to avoid holding others up. · Slow down to 6 knot within 60m of the ramp so that those launching their boats don’t get bashed with a wave of wash.
Like they say in scouts – be prepared. Now is the time to be checking over your boat for safety and maintenance. Leaving things to the last minute can often mean not getting out on the water when you had planned. For instance – charge your marine batteries well before your trip just in case they need replacing. The following is a pre-trip checklist of items needing to be operating soundly before you can safely take your boat on the water: bungs, safety equipment (oars, pfd’s, anchor and anchor rope, first aid kit, water and sun protection. Epirbs, flares, batteries and even lifejackets have expiry dates – so be sure to have them checked over or serviced prior. Obviously if your boat has been out of action or dry docked for more than a few months – make sure your outboard is serviced and running well. On the day, whether you are staying in the river or heading offshore, have a pre-departure plan to make sure you are prepared for whatever the weather has to offer. o have an emergency plan and let the other people onboard know it! With these rules in mind and consideration of our fellow boaties and recreational anglers – everyone should have a relaxing and enjoyable time on our beautiful waterways! The team at Swan Boat Hire would like to wish everybody a safe and happy Christmas and may Santa listen hard to all your tackle requests and put something special under the tree! 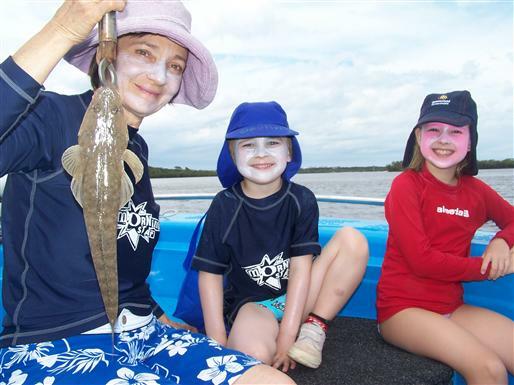 Noosa: Whiting and Flathead throughout the lower reaches. Trevally in Woods bay on lures. Large numbers of big flathead have been caught and released around the lower reaches . Mangrove jacks in both Lake Cooroibah and Cootharaba. Maroochydore: Whiting in good numbers around the top of the tide from Chambers Island. Bream from the creek mouths. Trevally on the top of the tide between the cod hole and Petrie Creek mouth. Mud crabs at the mouth of Coolum Creek, the top end of Petrie Creek and around Bli Bli bridge overnight. Kawana: Sand crabs in between Minyama Island and the rock walls. Mangrove jacks in the canals and in the upper reaches. Trevally throughout the lower river. Mud crabs in the canals and upstream of McKenzie’s bridge. 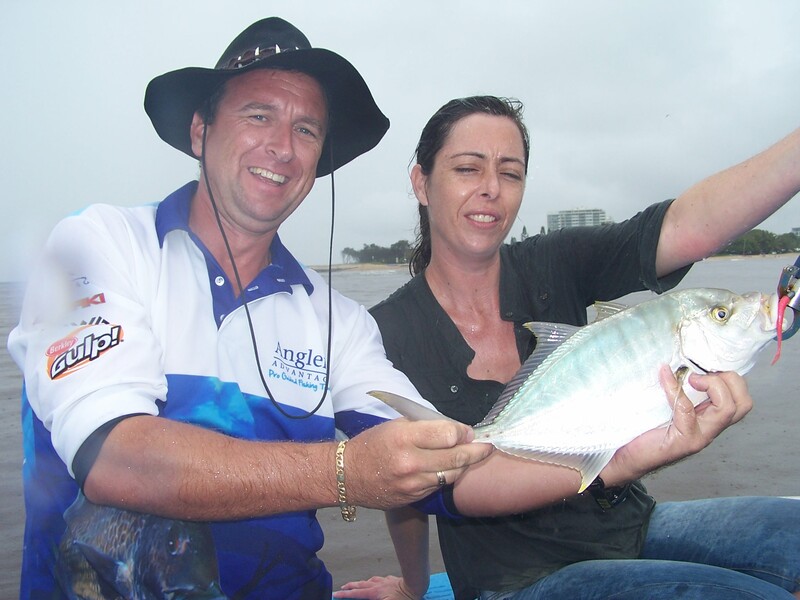 Caloundra: Trevally in Pelican waters and flathead around Military Jetty. Whiting from the power boat club and at the mouth of Bells Creek. Queenfish from the Boardwalk and around the mouth of Coochin Creek on live bait. Jackson Ross was fishing at Sunshine Reef with Noosa fishing legend Chicko Vella when he boated this 9kg mahi mahi (supplied by www.fishingnoosa.com.au). Robert Whiting was fishing in the Maroochy River Cod Hole when he caught a 34cm whiting and 57cm dusky flathead on live sand worms.